Throughout 1872 I had been in painfully ailing health, and was sickening, so I had mournful reason to augur, for some great malady. I continued, however, to work with dogged perseverance; and there is nothing to record touching the daily tale of bricks, which, in the way of leading articles, I had to lay. The year dragged itself out in physical pain and mental misery; and the New Year brought no amelioration in my condition. 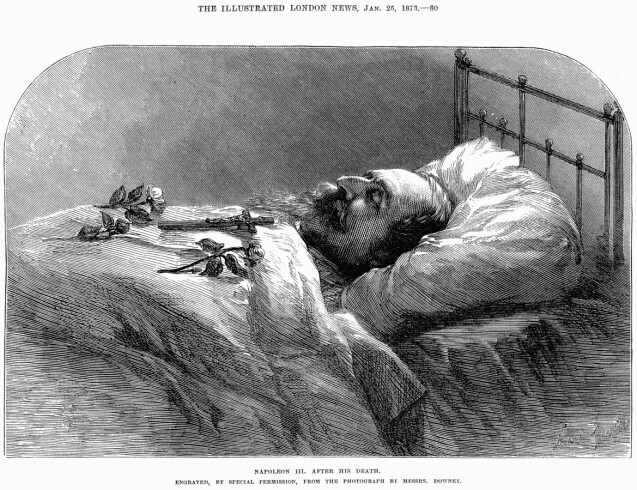 On the 9th of January, Napoleon III died, at Chislehurst, and had I been at death's door – that is to say, if I had only been able to crawl in and out of a carriage, I should have thought it my duty to my proprietors and to myself to attend the funeral of the ex-Emperor. It was settled that Edward Dicey and I should drive down to Camden Place in a brougham-and-pair early in the morning, as a tremendous rush on the railway traffic was anticipated. Dicey had already been down to the House of Death to see the lying-in-state of the deceased monarch, whose embalmed corpse – the moustaches duly waxed and the cheeks slightly rouged – lay in the coffin, visible to all who passed through the mortuary chamber, which had been converted into a 'chapelle ardente'. Throughout the day, which was one of the most arduous I ever passed, we had all of us to be grateful for the help rendered to us by Monsignor Goddard, the chaplain of the little Roman Catholic Church at Chislehurst, and by a most energetic and intelligent officer of police, the late Superintendent Mott. The ceremony in the church was exceedingly simple: indeed, it might have been the obsequies of a private gentleman. The church was draped in black and there were many lighted candles in tall candelabras; but there was no heraldic or Imperial display; nothing to remind you that the deceased had been Emperor of the French, and that he was a Knight of the Most Noble Order of the Garter. The young Prince Imperial was in plain evening dress; but he wore the broad red riband and star of the Grand Cross of the Legion of Honour. Looking at the poor bereaved lad, I could not help remembering the quiet rebuke given by his father when he was a captive at Luxembourg, awaiting trial after the Boulogne attempt, to a fussy 'juge d'instruction', who asked him by what right he was wearing the insignia of the Grand Cross of the Legion of Honour. “The founder of the Order”, replied Prince Louis Napoleon, “gave them to me when I was in my cradle”. The founder of the Order was Napoleon the Great. But how difficult, nay, how almost impossible, it is to exclude droll images from the most solemn scenes, and banish irreverent thoughts from the mournfullest cogitations! I really was sorry for Napoleon III, who had been kind to me, whose career I had followed with abiding interest, and who, notwithstanding all the errors which he committed, did, in his time of supremacy, an immensity of good to the French people. It happened while the service was being performed that a colleague sitting next to me asked the name of the particular function of the Roman Church which was being celebrated. I replied that I did not exactly know; whereupon I heard a voice, with a pronounced German accent, just behind me, saying, “Why, of course, it is a Low Mass.” I turned round and beheld my old acquaintance Herr Meyer Lutz, of the Gaiety Theatre, to whom the musical part of the arrangements had been confided. Imagine a momentary vision of Toole in 'Wat Tyler', and Miss Nellie Farren as Sir Reginald Plantagenet rising before me, even while the choir were chanting the awful strophes of the 'Dies Irae'! My presence at the funeral of Napoleon III was my last appearance in public for many months. It was a raw, bleak January day, and I went home with a chill; on which the next day some slight touches of fever supervened.